Expert article on how to properly size a whole-house air conditioner for your home. Included are tips for reducing the load on your air conditioning unit. Manufacturers produce whole-house central air conditioners in a range of sizes, which raises one of the most important questions you’ll have to answer when shopping for one: How big should it be? With air conditioners, the term “size” has nothing to do with a unit’s physical dimensions but, rather, its ability to produce cooled air. Both room-size and whole-house air conditioners are manufactured in a variety of capacities, so it’s helpful to understand how they are measured. An air conditioner’s ability to produce cooled air is measured in BTU (British Thermal Unit) per hour and in tons. A BTU measures heat output. One BTU equals the amount of energy needed to raise 1 pound of water by 1 degree F. One ton is the equivalent of 12,000 BTUs per hour, or the amount of energy it takes to melt 1 ton of ice in a day. When buying an air conditioner, bigger is not necessarily better. For one thing, the larger the capacity, the more a unit will cost since output is directly related to cost. Also, it’s important to pick a size that is appropriate for your house. An air conditioner that is too small can’t keep up with load requirements on a particularly hot day. One that is too large will cycle off and on too frequently, doing a poor job of dehumidifying the air, which degrades comfort. In fact, it’s better to slightly undersize an air conditioner than to oversize it. Also, the air flow into and out of rooms must be carefully balanced to ensure efficient operation of the system. These factors, in addition to how well a house is insulated, how it’s used by your family, your climate, and more must be taken into account when selecting and designing your system. Though you should consult a qualified air-conditioning contractor before making any purchase, you can estimate your requirements by figuring you will need about 1 ton of capacity for every 600 square feet of living space in a marginally insulated house located in a hot-in-summer region. For example, a 2,000-square-foot house might require about a 3.5-ton air-conditioning system. A newer, well insulated house can often be served by a smaller system. Again, this should be figured by a trustworthy AC pro. These simple measures will help you reduce your air-conditioning needs and save a bundle. When the weather gets hot, an air conditioner must work hard—that is, run frequently and for long periods—to keep a home at a comfortable temperature. 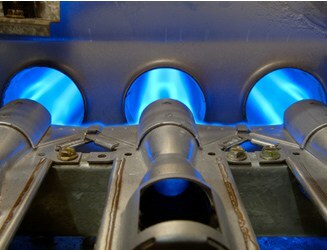 Considering the energy cost of running an air conditioner, the net result of this is high utility bills. If you’re able to minimize the temperature in your home by other means, you can cut down on the work your air conditioner must do. 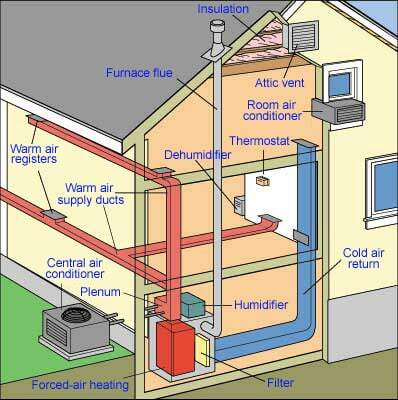 In fact, you can reduce the load on your central air-conditioning system by taking just a few simple measures. For starters, clean or replace your furnace or air handler’s filters. 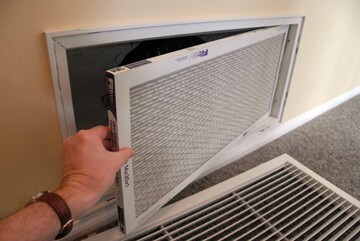 Clogged filters restrict the movement of air through the system, which reduces efficiency. Then consider the many improvements that can reduce your home’s heat gain such as utilizing heat-reflecting film on windows that face the sun, installing a foil radiant barrier in the attic, and improving your home’s insulation. Also to reduce heat gain you can simply pull shades or window coverings over sun-facing windows. Ventilation helps, too. Stir up breezes using a whole-house fan or ceiling fans, or circulate air using the “Fan Only” setting on the thermostat or equipment that controls your air handler’s blower. Also, when possible, minimize midday activities that add humidity to the air, such as washing clothes, showering, and cooking. Humidity makes the temperature feel warmer, and the air conditioner must work harder to remove humidity from the air.